Everybody knows that America's Racist Home Videos star Hulk Hogan gives Pinocchio a run for his money in the nose-growing stakes, and the ludicrous yarns he's spun about his famous match opposite Andre the Giant have long been a source of material on the wrestling comedy circuit. One liners such as: Hogan tore both his biceps slamming the 700lb giant in front of 93,000+ fans in the Silverdome (or was it the Superdome?). We know the Hulkster's tales are taller than the height he claimed Andre stood at, but surely his mendacity was tempered when discussing the occasion on the stand? Nope: the man's incorrigible. Whilst under oath during his trial against Gawker Media, the Hulkster was asked a string of irrelevant questions about the legendary contest. Despite laying his hand on a Bible, he simply couldn't help but pull a few porkies during the testimony. 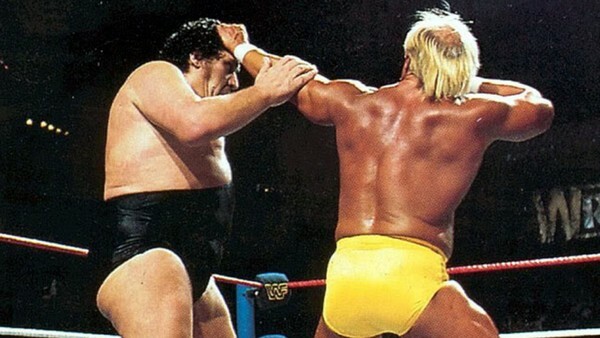 Hogan 'admitted' that he wasn't sure whether the Boss was actually "going to let him win" in the Silverdome, recounting that Andre was in a very bad state of mind. Hogan also revealed that it wasn't until the 11th hour that Vince McMahon greenlighted him prevailing in Pontiac. Of course, it's utter codswallop - but because it's sworn testimony, myth has to be considered legal truth. Lying before a judge is a serious crime, after all.